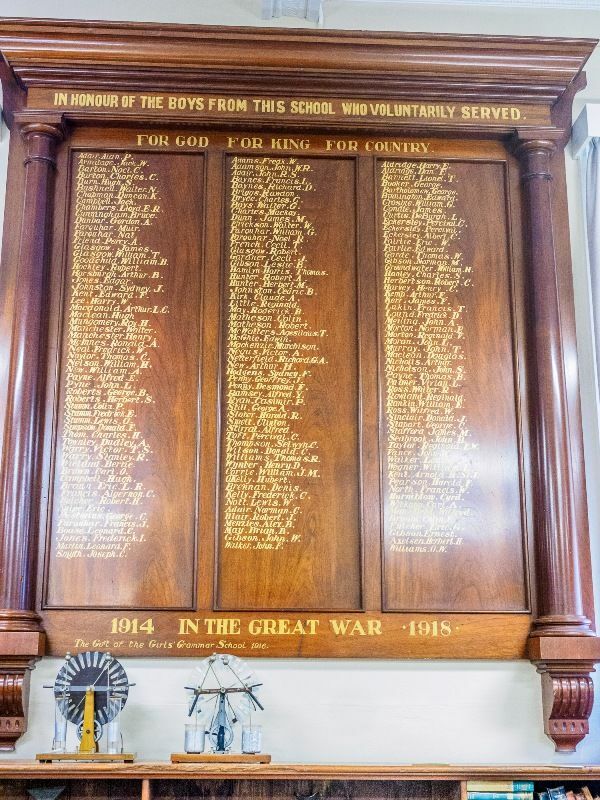 The Honour Roll commemorates former pupils of the school who served in World War One. The roll was originally unveiled in 1916. The annual Speech Day and the distribution of the Maryborough Grammar Schools was held at the Grammar School yesterday afternoon. 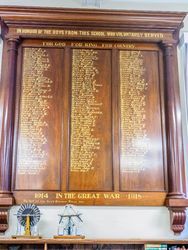 This year's annual function was made memorable by the fact that opportunity was taken to unveil the Honour Board, which was presented by the students of the Girls' Grammar School as a tribute to the gallantry of the boys from the Grammar School who have voluntary enlisted for service for King and country. The Head Master's report disclosed the fact that since the establishment of the school, some 35 years ago, 840 boys have passed through its doors, and of this number 150 have gone to the war including 13 who had so far paid the supreme sacrifice. The unveiling ceremony was entrusted to a returned Gallipoli hero, in the person of Sergeant Clark, an honour which was justly deserved. 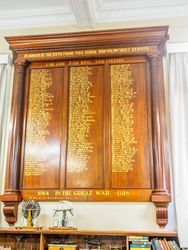 The board which contained about 150 names, was temporarily attached to the verandah wall, veiled with the Union Jack and the Australian flag. It stands 9 feet high, with a width of five feet overall and is made of beautifully polished cedar. It consists of three panels, each making a column of names. Artistically turned wooden columns on each side support the frieze and cornices. The base of each column is set off with fluted trusses. The board which is a splendid tribute to the workmanship of the designers, was made by Messrs. Jas. Kairlie and Sons, and was much admired. It is the intention an to erect it in a prominent position in the large hall of the Boys' School. Maryborough Chronicle, Wide Bay and Burnett Advertiser (Qld), 8 December 1916. The Maryborough Boys Grammar School was founded on the north side of Kent St in 1881 and the Maryborough Girls Grammar School on the south of Kent St in 1883. An assembly hall was added to the side of the Girls Grammar School in 1888. Hit hard by the effects of the Great Depression, the Grammar Schools were forced to close. They were subsequently taken over by the Department of Education in 1936 to become the Maryborough State High and Intermediate School for Boys and Maryborough State High and Intermediate School for Girls. IN HONOUR OF THE BOYS FROM THIS SCHOOL WHO VOLUNTARY SERVED. FOR GOD FOR KING FOR COUNTRY. The Gift of the Girls Grammar School 1916.